Go To Mount Kenya has qualified professional guides who are trained to lead on rock climbing expeditions to Batian and Nelion on Mount Kenya. The Guides have undergone training with NOLS Africa. Anybody intending to Summit Mt Kenya (Batian and Nelion) need to be 5.9 American Standard climber or hard server European standard. You need at least two days plus normal hiking time for Batian or Nelion. Climbing Mount Kenya is serious and it is important to acclimatize well before tackling the main summit. 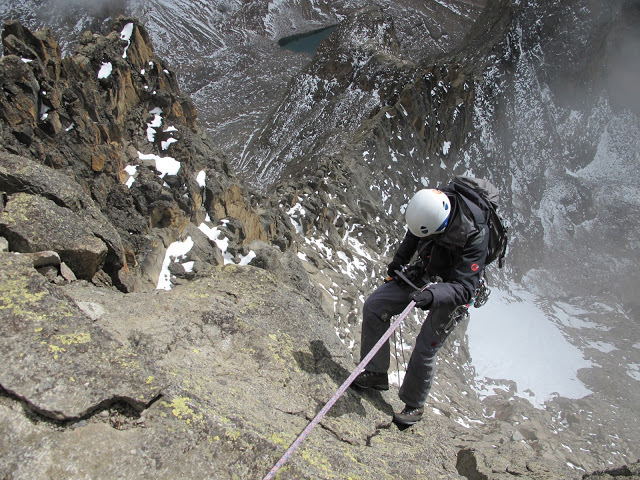 7 Day Mt Kenya Rock climbing via the North Face Standard Route. Depart from Nairobi at 0800hrs, driving through agricultural country up to Chogoria town for lunch. After lunch, we take 4×4 and drive up to the edge of the bamboo forest where we start our trekking through the dense bamboo forest for distance of 10 km up to the Mt Kenya Bandas. Day 2: Mt Kenya Bandas – Lake Ellis Campsite ( 3,600m) . After breakfast and sorting of porter loads we set off up the mountain at a nice and easy pace A slightly longer walk via Lake Ellis gives scenic views of Mugi, Ithanguni and the Giants Billiards Table, whilst if we follow the river near road head, upstream for about 3 km, the foreground scenery and flora is particularly beautiful. Lunch on the banks of a stream, then it`s time to cut up the left hand hillside to our camp at about 3,600m, well away from any of the more touristy areas. Day 3: Lake Ellis- Minto`s Camp. ( 4,200m) . Lunch is served at a small stream crossing, before continuing for a further hour to the Mintos Hut area at 4200m and our night rest. Afternoon is spent relaxing at camp, though a 10 minute walk to the Temple is well worth the effort. This is a 150 meters vertical cliff that gets its name from the position visitors often adopt when peering over the edge they look as if they are praying. You rise early and continue your trek up to Top Hut (Austrian Hut) 4800m. From this Hut you make a final short ascent of Point Lenana, 4985m,. Point Lenana is the common trekkers Mount Kenya Summit. From this summit you then go straight down the Northwest side to Shipton`s Camp, passing Harris Tarn. The route initially follows a wide couloir which you ascend for some 7 pitches, never harder than 5.7. A bit of easy scrambling brings us to the Amphitheater, a small basin of easy rock part way up the route. Ideally we arrive here by about 7:30 or so, enjoying a short break. Above this is the crux of the route, Firmin’s Tower. There are about 3 difficult pitches, all fairly short, but all in the V grade. Above this, easier terrain leads to a few more pitches and, finally, the west ridge. From this point, we continue on easy, but still exposed, rock to Shipton’s Notch, a prominent gash in the summit ridge. Another pitch, then mixed 4th and easy 5th class rock leads to the airy summit of Batian. You’ll then descend via the same route hopefully hitting Shipton’s Camp before evening dusk for dinner and overnight. After breakfast descend to Shiptons camp via Simba col after which you begin a 5 hour descent via Mackinder`s valley to the Old Moses camp. The descent is gentle and it offers ample time to enjoy fascinating scenery which includes the moorlands before reaching the camp. NB: Due to the unpredictability of weather around the Summit, we sometimes allow for an extra Summit day thus extending the climb to 8 Days. However, kindly be aware that an additional day on the mountain attracts US$ 165.